Experiencing Disney's (DIS) theme parks in this country is going to change for guests with disabilities next week, and they're probably not going to like it. Oon Oct. 9, the family entertainment giant is eliminating its Guest Assistance Card, a program that's been in place for years as a way for physically or mentally challenged guests to get on rides and attractions without having to line up in the traditional queues. 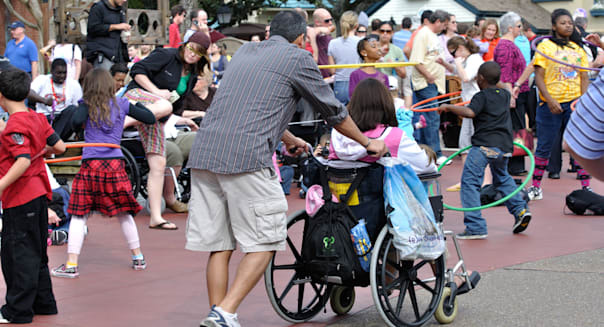 Disneyland and Disney World visitors lining up at Guest Relations to acquire the card will instead be introduced to the new Disabled Assistance System. Unlike the current program that offers handicapped guests unlimited access to rides with as many as five friends and family-members, the new photo-based passes will force users to wait the entire length of the standby time before boarding. They are welcome to explore the rest of the park in that time, but they can only have one open reservation at a time -- making it somewhat similar to Disney's popular Fastpass program. That could lead a lot of families who have children with special needs to rethink their next Disney trip. Many will argue that the new system is more than fair. Why should disabled adults or families with challenged children have an advantage at the theme parks? The Americans with Disabilities Act was put into place to level the experience. It wasn't drafted so handicapped patrons would enjoy more shows and attractions. %VIRTUAL-article-sponsoredlinks%The Guest Assistance Card system was also widely and easily abused. Disney can't hold out for proof of a disability as part of the Americans with Disabilities Act, which led to a lot of ruthless teens and even adults renting wheelchairs or making up maladies to be bestowed the time-saving pass. That was already a problem, but everything blew up in May when a scathing New York Post exposé detailed how a disabled woman was making money selling VIP tours to affluent families. Well-to-do New Yorkers were paying $130 an hour -- far less than Disney's own VIP offering -- for "black-market Disney guides" whose presence would let them bypass the long queues at Disney World. "My daughter waited one minute to get on It's a Small World," a mother bragged. "The other kids had to wait 2 1/2 hours." Truth be told, no one has ever had to wait 150 minutes for that particular attraction, but the furor resulted in a growing backlash against the Guest Assistance Card. Disney needed a solution. It chose the Disabled Assistance System. There is no easy compromise, but in the push to inconvenience the abusers Disney finds itself punishing those that actually need the pass. As the father of a child with special needs, future visits to the parks with my son will be more challenging and less frequent. He was misdiagnosed with hydrocephalus at birth 15 years ago, and a year after the ventricular shunt was put in we received a bombshell: brain cancer. After surgery and a couple rounds of chemotherapy failed to eradicate the disease we were down to the unsavory option of radiation. It worked -- he's been cancer free for a dozen years -- but you don't nuke a child's brain and get a fairy tale ending. He goes through hours of therapy a week to deal with the development delays, sensory integration issues, and emotional demons that he tackles perpetually. His setbacks fall into the autism spectrum, and that's essentially the only kind of school that will take him. When we go to the parks, it's never an all-day affair. Like many children with ADHD, Asperger's Syndrome, and other autistic strains or afflictions that cut social outings short, we're there for a couple of hours at best. Armed with charter annual passes and the Guest Assistance Card we've been able to tackle a lot before it's time to head out as the crowds storm in. We were never able to conquer as many rides and attractions as all-day guests despite paying as much. The new Disabled Assistance System will make visits by parents of autistic children even less productive before meltdowns and stern looks from judgmental park guests cut short treks even shorter. One can only imagine that bookings for Comcast's (CMCSA) Universal Orlando resort will spike for families with special needs children and disabled Florida tourists in general. All guests staying at any of the three on-site hotels receive expedited entrance on most of the Universal Studios Florida and Islands of Adventure rides. Disney and rival theme parks have been cognizant of disabilities by making queues wider for guests with wheelchairs and other mobility issues on newer attractions. But it will be hard to pacify those who have behavioral issues where a lack of patience isn't a matter of being spoiled. Disney did work with Autism Speaks on the new policy, and the advocacy group is urging parents to see how it unfolds before raising a stink. That's fair. I'll give it a shot later this month to see how it plays out. But I know I won't be the only flustered parent that's bracing for the worst.